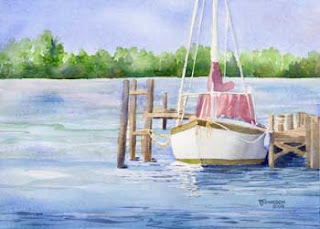 After adding another very faint wash to the background water (it seemed too disjointed before), and a few little touches here and there, like the very tiny line of shadow under the right edge of the boat where it meets the water, well,...I am happy. I think this little piece is complete. If you enjoyed this lesson, please let me know by posting a comment. f you would like to paint along with this lesson, go to my etsy online shop and click on the Online Class icon. For $5.00 I will send you the reference photos and the prepared drawing in a pdf file format via email. Then, you can paint along each day as I describe with photos and journaling, how to paint this little picture.You can go the older posts, print them off and use them as a workbook. A new lesson will be posted soon. Become a Follower and you won’t miss the new things coming up! You can see my work at the Art & Antique Studio Gallery in the Eau Gallie Arts District (EGAD) in Melbourne, Florida.